What people have to understand is that the Federal Reserve is moving in the opposite direction with respect to its monetary base. The Adjusted Monetary Base is the sum of currency (including coin) in circulation outside Federal Reserve Banks and the U.S. Treasury, plus deposits held by depository institutions at Federal Reserve Banks. These data are adjusted for the effects of changes in statutory reserve requirements on the quantity of base money held by depositories. 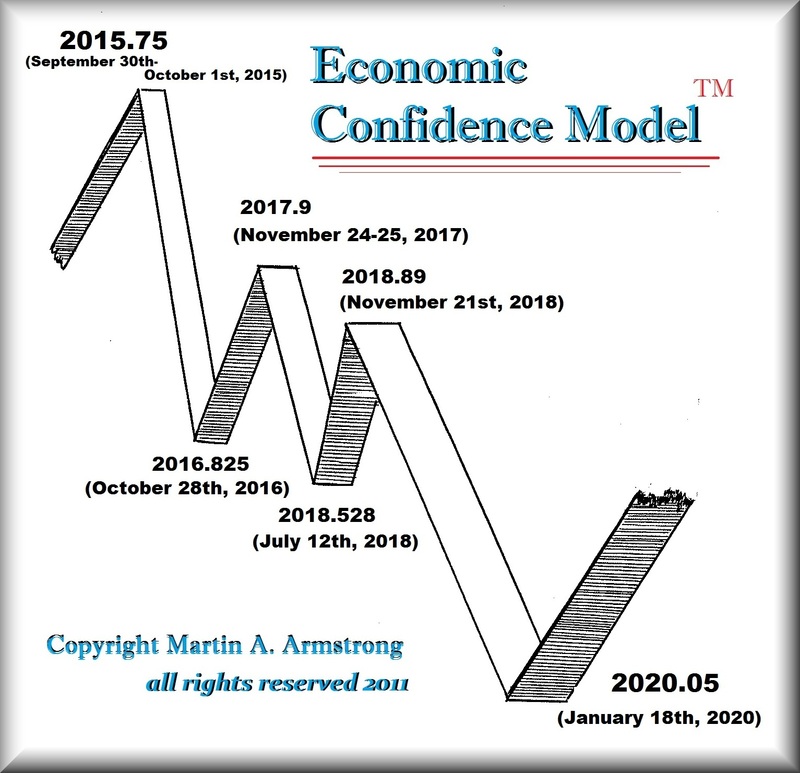 This peaked with the Economic Confidence Model turn in 2015 on October 1st. The Fed has been shrinking its balance sheet and believe it or not, there has been growing a SHORTAGE of dollars contrary to those who keep saying the world is awash with dollars so buy gold, cryptocurrencies, or whatever. I have been stating that (1) we are in a major bull market for the dollar, and (2) it is the US economy that is supporting the world. What I mean is simply this. Everyone from China to Europe is DEPENDENT upon trade with the USA because it is the US consumer who is the marketplace. The balance of the world CANNOT win a trade war with the USA. They have focused on selling to the USA rather than developing their own domestic consumer economies. China has shifted and understood that important distinction and has indeed turned its focus to developing a domestic economy. Europe has not and it is significant to comprehend that the structure of the European Union is disastrous. They want to PRETEND to be the federalized entity of Europe, but all 28 member states must agree on trade. This PREVENTS Germany from accepting Trump’s proposal to abolish all tariffs because France will not agree to an absolute free trade and that will prevent the EU from acting in the best interest of the whole. It requires unanimous consent. Australia has imposed a 10% tariff on anything purchased overseas and they expect foreign businesses to collect their taxes. They call it a GST, but it is imposed on all products as a protective measure they claim for local businesses. FREE TRADE is simply not feasible politically while Trump gets all the blame. The rest of the world CANNOT win a currency war. So far, our computer has been spot on. We are headed toward a monetary reset in the years ahead but to get there, we must experience a STRONG dollar – not a WEAK dollar. The sooner these pretend analysts stop the same rhetoric that stems from the broken Quantity Theory of Money, the sooner we will begin to truly understand how the economy works. Turkey is a live example of the most vital element of all – CONFIDENCE. When that is lost, this is what produces hyperinflation – NOT the quantity of money. There is a SHORTAGE of US dollars on the trading desks around the world – not an excess. This is also what is behind the bid.